The Rock Tribe is a group of nomadic Stone Age hunters, who constantly battle with their harsh environment for survival. Their leader has two sons, a good, fair one and an evil, dark one. The fair one becomes the leader of the tribe on their father’s death, but a deadly struggle of good against evil breaks out when the dark one challenges his brother’s position. The film was photographed entirely on location in South Africa. 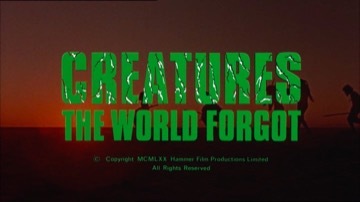 The vast areas of naked flesh are nearly as expansive as the desert locations in this, Hammer’s first X-rated prehistoric romp. However, there are no dinosaurs, their extinction this time being due to a lack of budget, rather than to any sudden climatic change or the earth being hit by a giant asteroid. A case not so much of being forgotten as being unaffordable! Julie Ege was a former Miss Norway whose brief film career also included the Marty Feldman comedy, “Every Home Should Have One” (1970) and Hammer’s “The Legend of the 7 Golden Vampires” (1974).